NEW YORK, August 25, 2016 - The International Center for Transitional Justice (ICTJ) welcomes the historic peace agreement between the government of Colombia and the rebel Revolutionary Armed Forces of Colombia (FARC). The agreement marks the successful culmination of the negotiation phase to end the longest civil war in the western hemisphere, which has seen more than 220 000 people killed, thousands of cases of enforced disappearances and kidnapping, sexual crimes and gender-based violence, forced recruitment of minors and the displacement of more than six million people. All parties to the conflict – right-wing paramilitary groups, the Army, FARC and other leftist guerrillas– have contributed significantly to the atrocities visited on the Colombian people over more than five decades. The challenge facing the signatories now will be to clearly communicate the details of the agreement and the benefits of peace to the population that will vote on it in a forthcoming national referendum. One of the key provisions of the peace agreement refers to mechanisms envisaged to fulfill the rights of victims of serious crimes committed during the conflict. While it is commendable that victims were invited to offer views on solutions built into the agreement, the real challenge lies in the implementation of the proposed mechanisms. ICTJ has worked in Colombia since 2003. We focus on strengthening national mechanisms for the protection of victims’ rights to truth, justice, and reparation. For more information about ICTJ’s work in Colombia and relevant publications visit our country page. 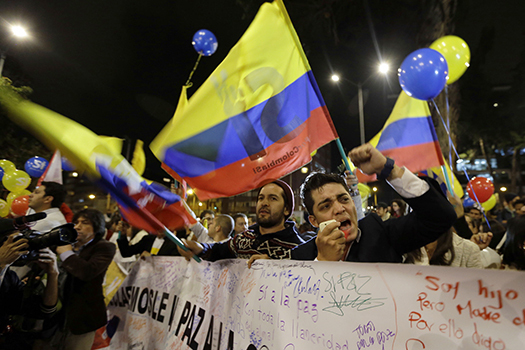 PHOTO: People celebrate the peace accord announcement in Bogota, Colombia (AP Photo/Fernando Vergara).